John E. Wilson, Ph.D., Clinical Professor of K-12 Educational Leadership, is Program Director for the Doctor of Education (Ed.D.) in K-12 Educational Leadership. He is a professional educator with more than four decades of experience, having served seven different public school districts in a 34-year career. He served more than two decades in the role of superintendent of schools. He was superintendent most recently of the Clear Creek ISD, where district enrollment grew by 7,000 during his eight-year tenure. He was also superintendent in Amarillo, Greenville and Cuero Independent School Districts. He has twice been the keynote speaker for the Urban Superintendents Association of America Academy for Superintendents and served as the president of the Texas Association of Suburban/Mid-Urban Schools. In addition, business ownership provided experience in consulting with private and public school districts, private businesses, law firms and public agencies. 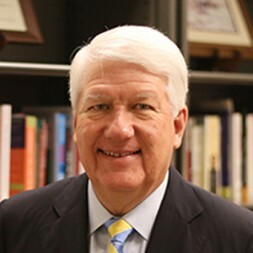 Before joining the Baylor graduate faculty in 2010, he taught in higher education as an adjunct professor at Texas A&M University-College Station, Texas A&M University-Commerce, West Texas A&M University-Canyon, University of Houston-Clear Lake, Houston Baptist University, and Lamar University-Beaumont. Dr. Wilson's research and scholarly interests are in K-12 policy and leadership, preparation of K-12 education executives, politics of education, governance, education law, organizational behavior and persuasive communications. Dr. Wilson is focused on creating in his students a passion for learning, a positive leadership style embedded with virtues of ethical leadership. His expertise is in mentoring and developing leaders. Leadership roles in school districts, communities, and organizations include President of Texas Academic Decathlon, President of Texas Association of Suburban/Mid-Urban Schools, Board of Trustees for Hardin-Simmons University, and the Advisory Committee for Texas A&M University System Center for Leadership in Higher Education. Dr. Wilson received The National Aeronautics and Space Administration Public Service Medal for exceptional contributions to the NASA program through a partnership with Clear Creek schools. He also received the Omicron Delta Kappa Baylor University Sesquicentennial Men and Women of Merit Award and was a Danforth Fellow.